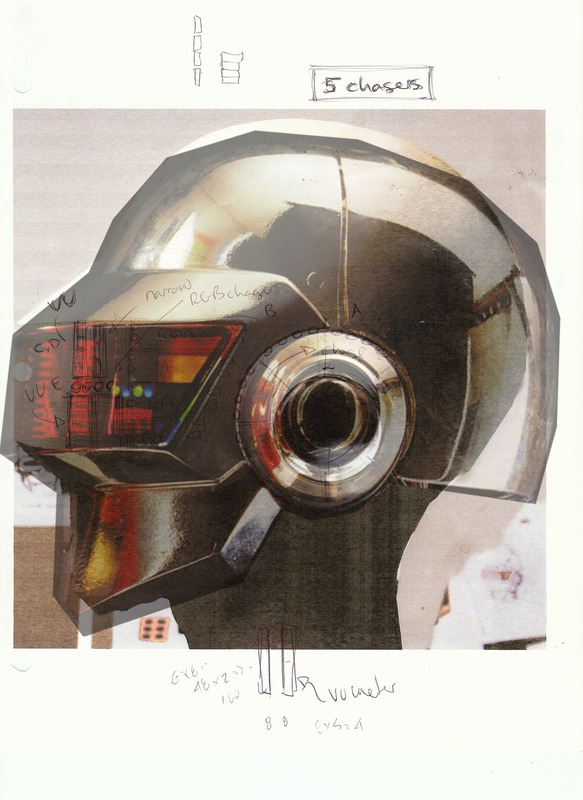 It's been roughly 13yrs since the original Daft Punk robot costume helmets were created (that was December 2000). They have changed only slightly over the years, and still as impressive and avant-garde as ever, as shown by their recent acceptance and reaction at the Grammy Awards. Obviously there is an ongoing (and increasing) interest in not just the band, but also their alternate robot personas. I was chosen to work on this project based on my previous experience with costume electronics and robot lighting effects. These include Special Effects from a range of movies including Robin William's title character in Bicentennial Man, full robot control systems and lighting for Steven Spielberg's A.I., and costume electronics and lighting for the space suits used in Red Planet. The images above and to the left are photos of the original sculptures (while in progress), with my hand-written notes taken during design meetings with the band's Art Director. 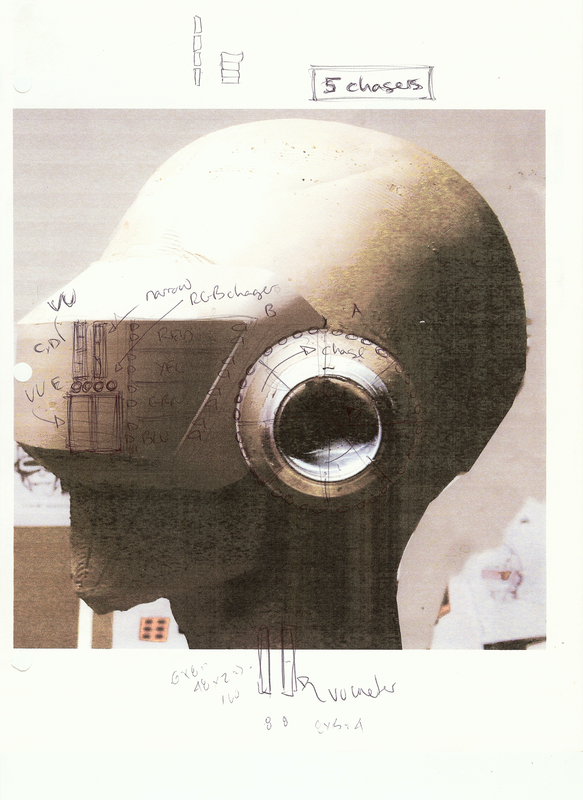 A couple of interesting things in these original design notes: First, on Thomas' helmet, you can see there were supposed to be a small set of "UV" meter LEDs on the collar. The mechanical collar idea never made it into the final product, so obviously this feature didn't either, although the circuit and PCBs were fabricated and stuffed. Funny but true: the ear piece is actually the bottom of a Pepsi can! Kind of obvious when you see it in the raw clay. 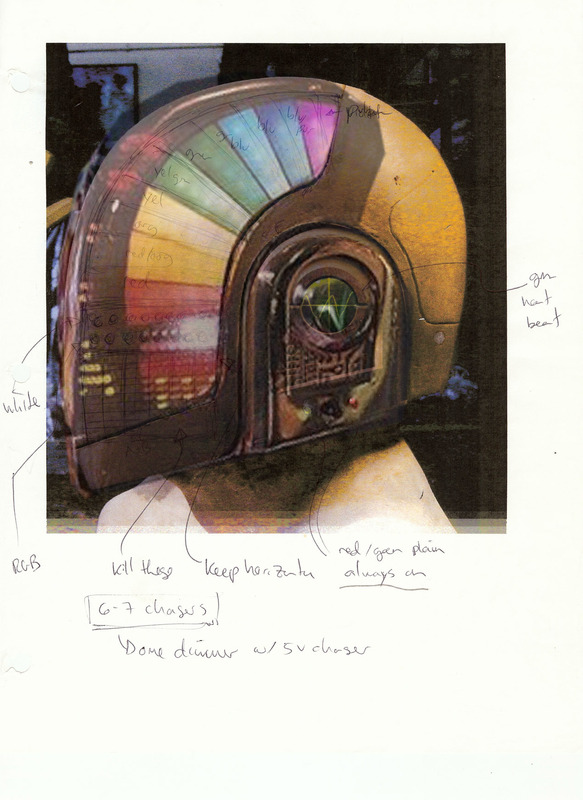 On Guy's helmet, the original plan called for as many as ten colored segments. 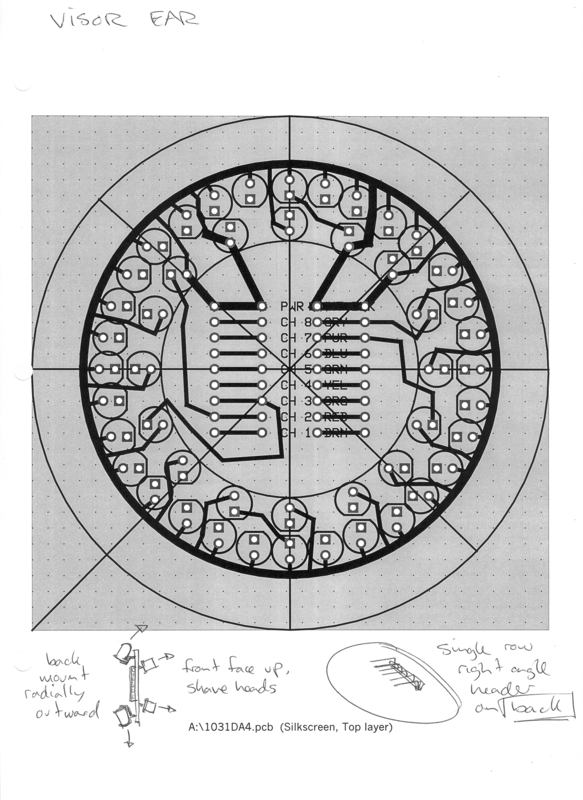 But practicality won out and we went with eight, since all our pre-designed chaser circuits were 8-bit. 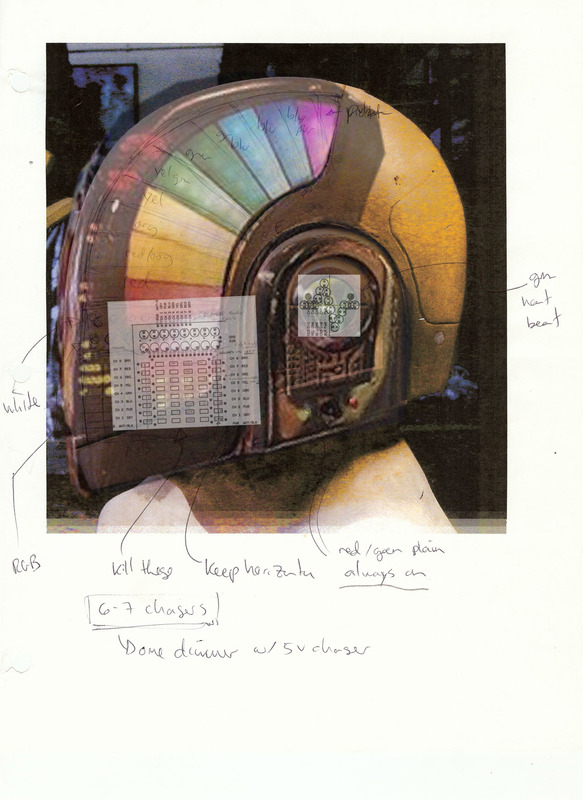 The notes for Guy's "UV" meter circuit board and other auxiliary light are nearly exact to the final product (see composite below), including the "kill these" notes on the hidden LEDs. PCB circuit layouts (from left to right) Thomas' side rainbow and UV meter, Thomas's ear chaser circuit, Guy's lower voice-activated UV circuit, Guy's ear "heart beat" circuit. 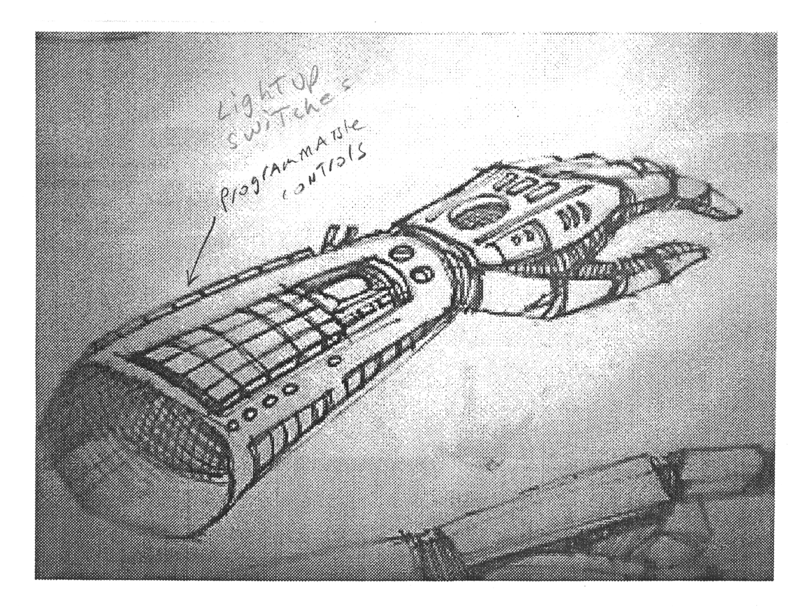 Concept sketch for the "gauntlets", which had buttons for controlling the helmet LED chaser sequence patterns. 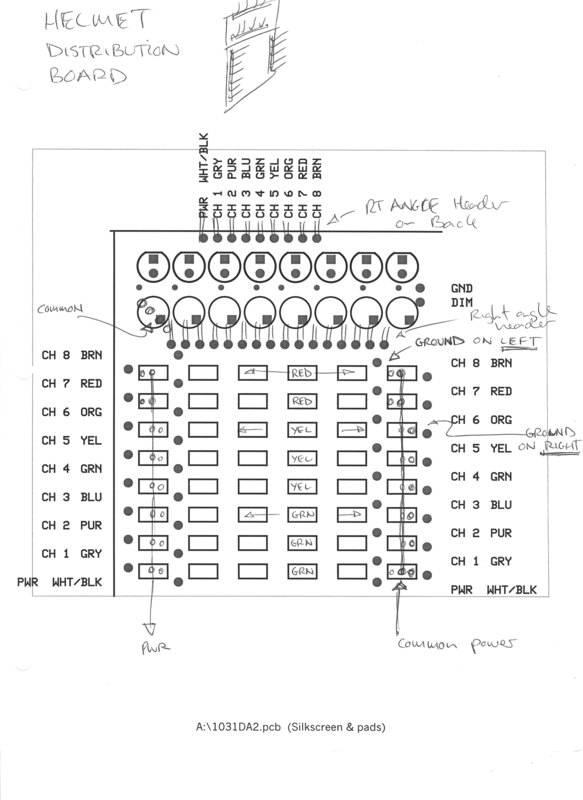 These gloves communicated through a serial UART interface to the backpacks containing the chaser circuits. The glove buttons were lit with LEDs as well, adding to the overall costume effect. 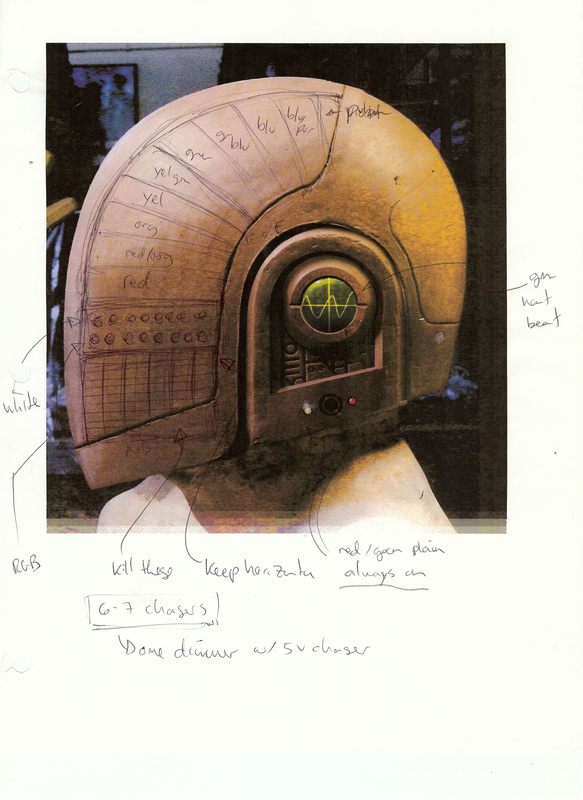 Three panels that demonstrate the design progression on Guy's helmet: Left panel has the original design notes over the sculpture. Center panel shows how the sculpt compares to the final result. 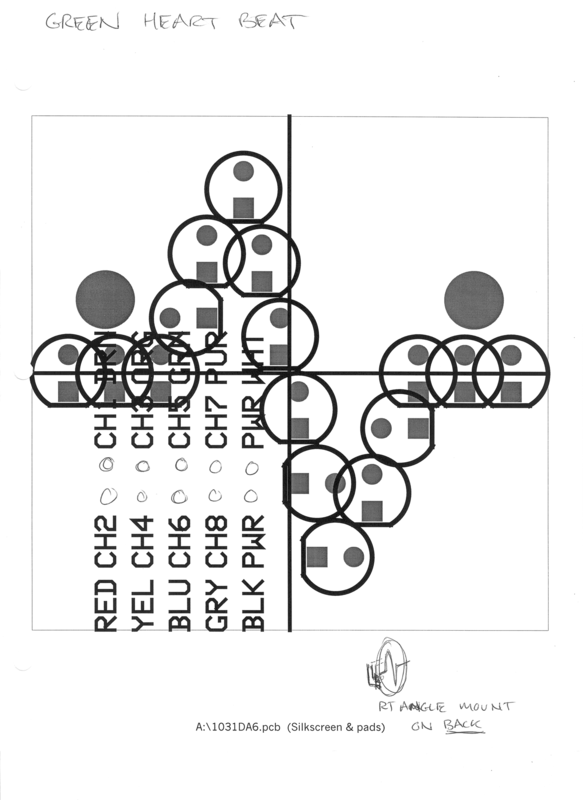 Right panel is an overlay of the PCB showing LED locations. 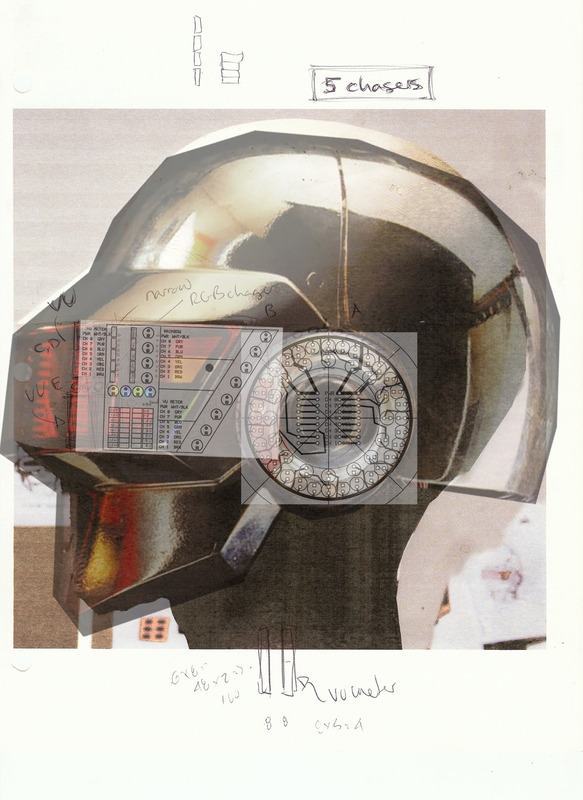 Similarly for Thomas' visor, three panels that demonstrate the design progression: Left panel has the original design notes over the sculpture. Center panel shows how the sculpt compares to the final result. 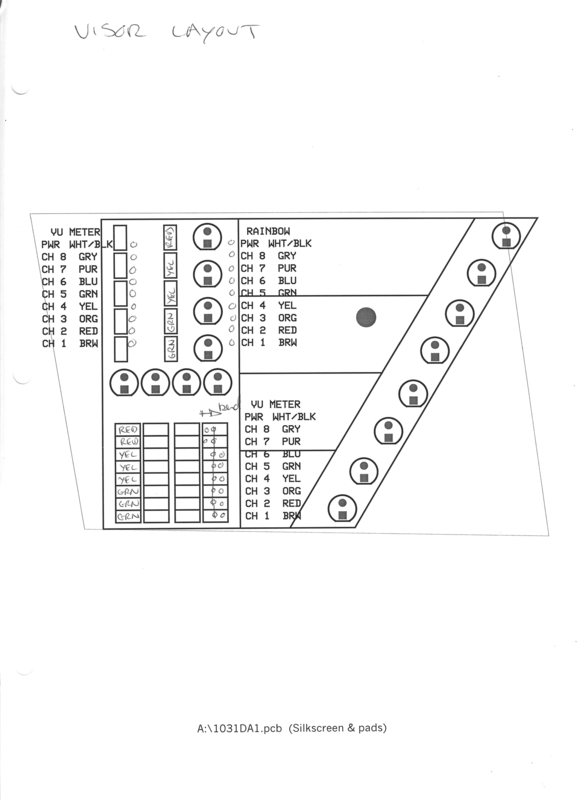 Right panel is an overlay of the PCB showing LED locations.